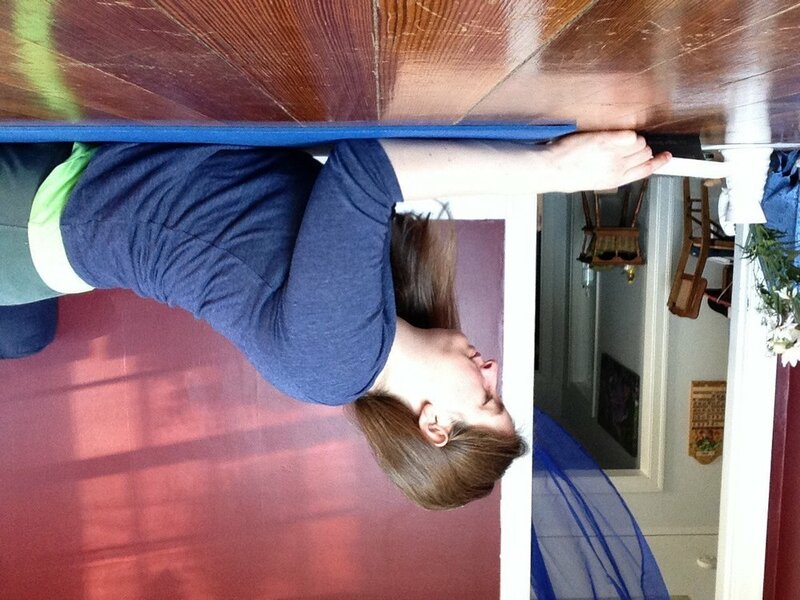 Five Minute Yoga Break - Live on the floor! Chairs. They are something we don't even think about in this country. They're everywhere! We use them all the time without a second thought. But have you ever considered what they're doing to your body? I often ask people that come into the studio what they do for a living because it instantly gives me great insight as to why they might find certain things challenging. More and more, everyone's work involves sitting in a chair for long hours using a computer. The more we sit in chairs, the more our hips tighten up, our low backs get compromised and our core strength heads right out the window! I know this first hand. I used to work in NYC at a job where I was at a desk working at a computer 7 or more hours a day. I did that for over five years. Add to that a long commute and I was definitely not feeling my best in those days! So if you can't quit that day job just yet, what's the solution? This is Sphinx pose, a posture that we use a lot in our Yin Yoga classes at Forever Yoga. This is a great way to read a book or watch TV and do some yoga while you're at it! To get there, simply lay on your belly and then walk your elbows back toward your hips lifting your head and upper torso. Pay attention to wherever you feel sensations rise in your body. For most people you might notice this in your low back but it may be somewhere else. Wherever the sensation is most present, make sure that you keep it a mild to moderate sensation. If it's too much, walk your elbows farther forward. You can stay here for 3-5 minutes or more as long as you don't feel any sensations of pain. This pose can help reset the curvature of the low back spine counteracting all that chair sitting we tend to do. For more information about this posture and it's contraindications (such as pregnancy), check out YinYoga.com's description of Sphinx pose. And if you're in the Southern NH area and are curious about what Yin Yoga has to offer, check our Schedule Page. We offer 3 Yin Yoga classes throughout the week and would love to have you join us!